Following an introduction by Manchester International Festival Director Alex Poots and its Artistic advisor Hans Ulrich Obrist in 2013, artist Gerhard Richter and composer Arvo Pärt were inspired to make new work dedicated to each other. Bob Dickinson attended the premiére of this new collaboration at Mancheter’s renovated Whitworth, and discovered one of the highlights so far of MIF 2015. The Whitworth’s new Landscape Gallery is crowded with guests, staring at what’s displayed on the walls: two sets of new work by Gerhardt Richter, one of which, Doppelgrau (Double Grey) responds directly to his new friendship with the Estonian composer, Arvo Pärt. They met for the first time in Dresden in 2013, brought together by Manchester International Festival, and what follows is one of the highlights of MIF 2015 so far. Suddenly, vocal harmony breaks out all around. Embedded in the crowd and casually dressed, there’s a 14-voice choir singing a piece by Pärt, composed in response to Richter. It is a moving and surprising experience, and the whole room becomes absolutely still. Near the doorway stands the bearded figure of Pärt himself, hands clasped together – perhaps worrying about some musical detail, perhaps praying. 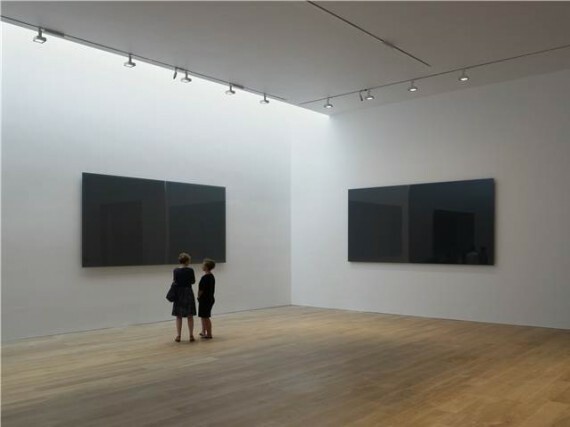 Richter’s new works are about reflection and response. Each Doppelgrau is a pair of glass squares, toughened in a furnace and double enamelled, using grey pigment. The tone of grey varies slightly from square to square. Each square is hung 12mm from its partner – the exact width of Richter’s studio manager’s finger, so despite the greyness, there’s something human about the arrangement. One sees dark grey reflections of other Doppelgrau in each square. One pair is hung at each end of the gallery, and two pairs along the wall on the right as the viewer enters. Facing these on the left is Richter’s other work, Birkenau. 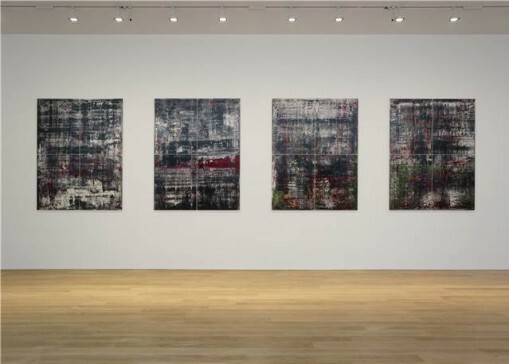 Richter is famous for painting over photographs and for making ‘photo versions’ of his own paintings. Birkenau comprises photo versions of four abstracts done in 2014, each quartered and laid on aluminium, covered in acrylic and hung to make a narrow cross-shaped gap between the quarters. These brooding works, based on photographs taken by a prisoner in Auschwitz, invite further reflections, this time on history and humanity. The colouring – black and white with patches of red – suggests light reflecting on water, perhaps referring to the pools of water at Auschwitz Birkenau into which human ashes were thrown. Richter’s connections with music have taken him from Bach to Cage to Sonic Youth and now Pärt, whose new vocal work, Drei Hirtenkinder aus Fatima, was inspired by the story of a series of visions experienced by Portuguese children in 1917, one of which predicted the Second World War. It will be repeated every day in the gallery until 19 July. Encountering the music inside this self-reflecting series of artworks by Richter is a unique experience – and admission is free. 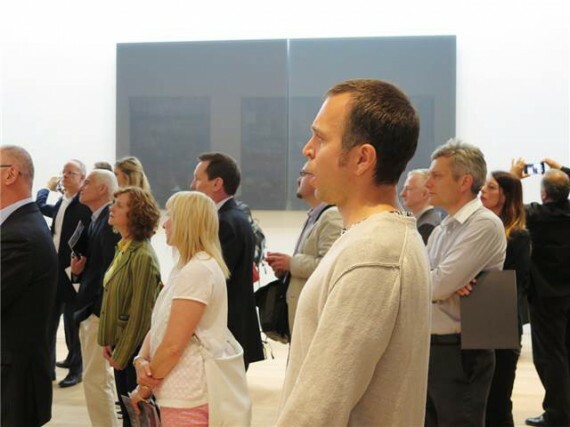 Richter / Pärt continues at The Whitworth, Manchester until 19 July. See www.mif.co.uk/event/richter-part for performance times.